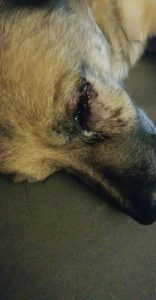 Update 8/9/18 Duke has been evaluated by a vet and it is hopeful that surgery to the eye will not be necessary. He has been given medication to keep him comfortable and to fight off any infection. He will be seen again in a week and we will know at that time about surgery. Thank you! Duke got out the front door last night, there was another dog being walked on a leash and duke approached him wanting to play. The dog started to growl at Duke and the attacked him, he had my dogs head in his mouth it took 3 people to get them apart. He has an eye injury that really needs to be taken care of. Any help is appreciated.